Mahindra TUV 300 Plus offers seating capacity for up to 9 people. Mahindra is getting aggressive in terms of launching new SUVs. Having found its ‘sweet spot’ the company is focussing entirely on its Sports Utility Vehicles. The company even invested in the US establishing a plant to manufacture electric SUVs for the domestic market. Mahindra’s green counterpart will be launching a new electric SUV at Auto Expo 2018. The constant launch of new vehicles overshadows the current lineup hence the latter has to be refreshed every now and then. In this case, Mahindra introduced an entirely new variant to the TUV 300 lineup. Read on to find out. 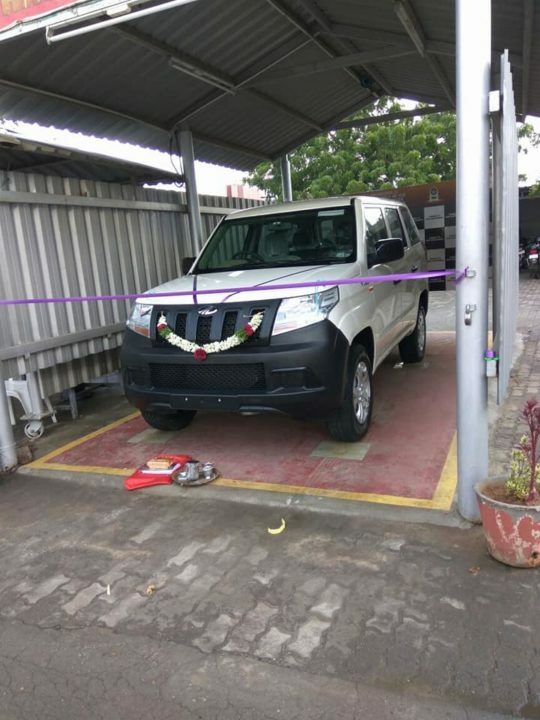 As per the source, Mahindra has started delivering TUV 300 Plus to select customers across the nation. The yet to be launched TUV 300 Plus is expected to be showcased at 2018 Auto Expo. Further, the deliveries were confirmed by Mr Anand Mahindra himself. “We’re seeding a few vehicles in the market before the launch next year,” Mr Mahindra Tweeted this week. 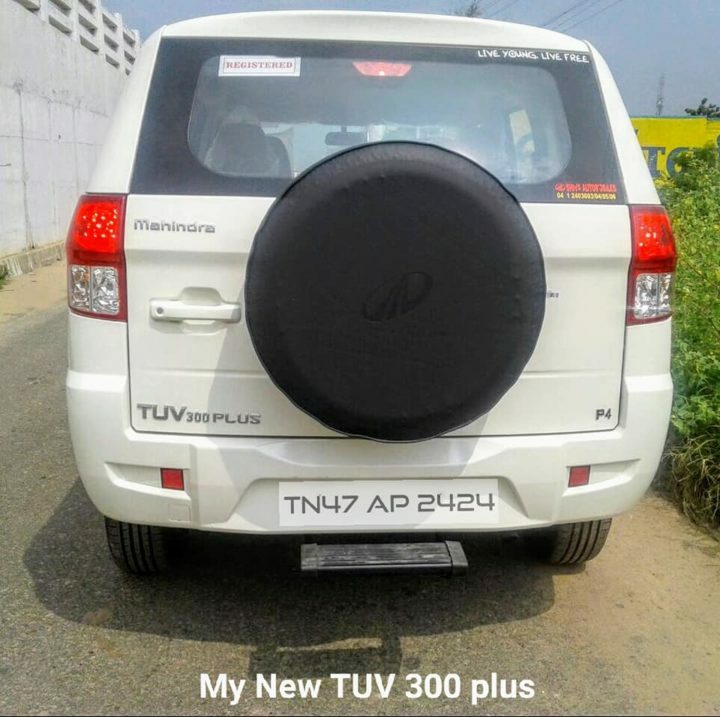 The pictures display a customer receiving the delivery of his TUV 300 Plus in some part of Tamil Nadu. Mahindra TUV 300 Plus gets a bump under the hood and the 1.5-litre mHawk doing its duty in the TUV 300 has been replaced by a 2.2-litre mHawk engine. The new four-cylinder diesel engine produces a maximum power output of 120 PS and 280 Nm of maximum torque. The engine comes mated to a 5-speed manual gearbox. If reports are to believed, an AMT option is in the works and might be launched sometime down the line. Based on the TUV 300 platform, the Mahindra TUV 300 Plus is essentially a stretched version of the former. Mahindra redesigned the portion behind the C-Pillar to adjust 2 more parallel seats behind the last row making space for 2 more passengers. With the increase in length, the overall character of the otherwise shrunk TUV 300 has improved. We are no fans of the staking C pillars but to the targeted audience, they might appeal. The new 2.2-litre mHawk diesel engine has been detuned so expect higher efficiency. The Mahindra TUV 300 Plus is expected to deliver an average fuel consumption in city and highway of about 14 kmpl and 19 kmpl respectively. The final numbers will be revealed at the formal launch of the upcoming SUV. Stay tuned for more info. The P4 variant of the upcoming TUV 300 Plus is priced at INR 9.46 lakh (ex-showroom) as per the invoice shared online. The entire TUV 300 Plus lineup will be priced between INR 7.5 lakh to 9.8 lakh. The deliveries will commence post the official launch of the TUV 300 Plus at the upcoming 2018 Auto Expo.